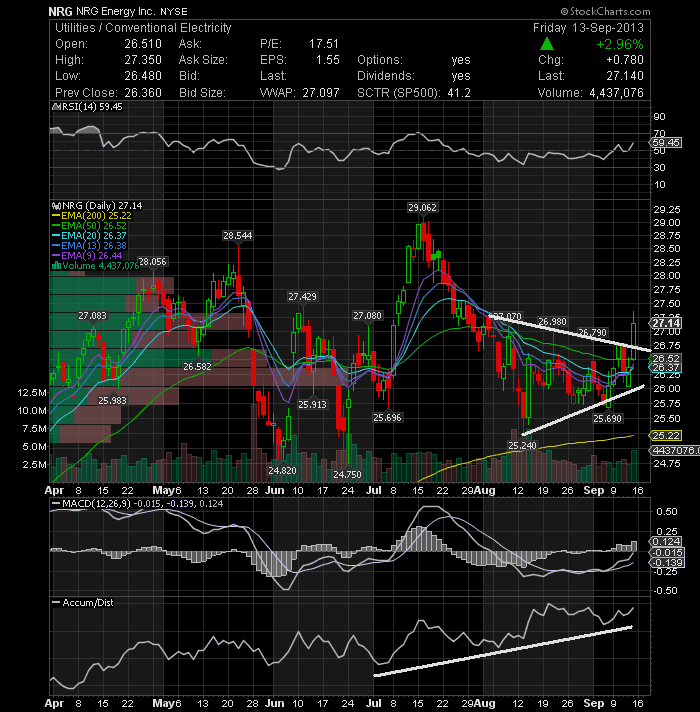 NRG Energy Inc (NYSE:NRG) gave a breakout from a symmetrical triangle pattern last week. Considering the triangle formed, the target price is around 29. The volume on the break out is really good that comparing the daily volume, it has surpassed the average volume of around 1M shares traded. It's a signal that the momentum is starting to pickup again. 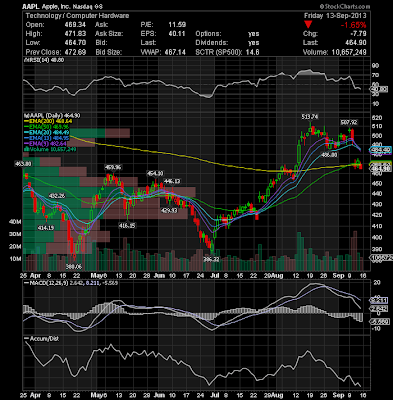 Apple Inc. (NASDAQ:AAPL) The stock's chart still does not look good for now. 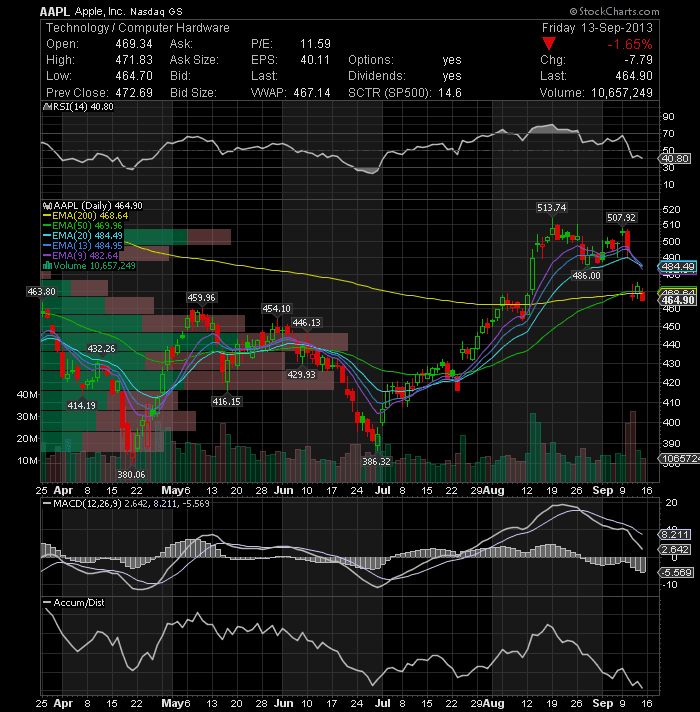 AAPL closed the week below its major EMA's in the 469 area. It has been in a short-term correction since making a high of $513.74 on August 17. The stock needs to rally past 487 to turn the short-term bias to positive. If that doesn't happen, there can be a slide to 450 or 430. Kirby Corporation (NYSE:KEX) had a nice bullish run last week. 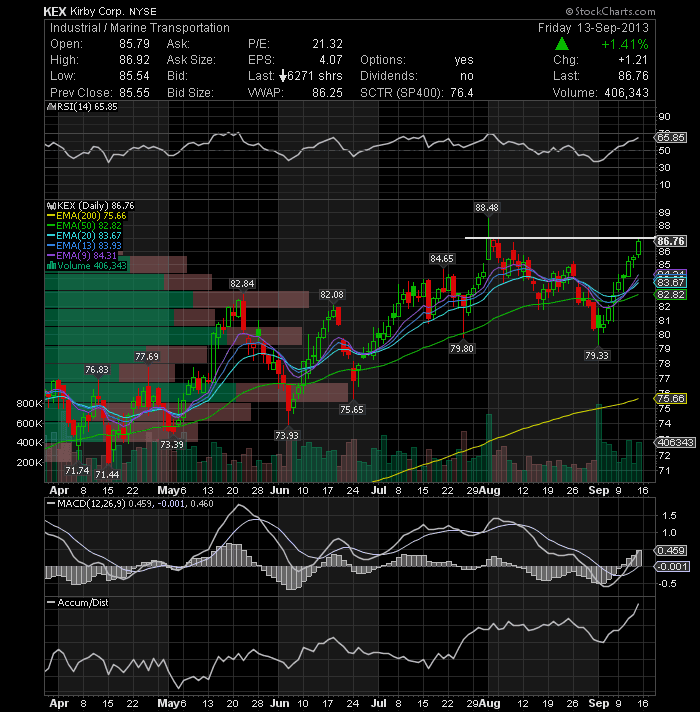 Chart looks bullish and a break of the 87 level could prompt a pretty quick run towards 88.48 (52-week high). 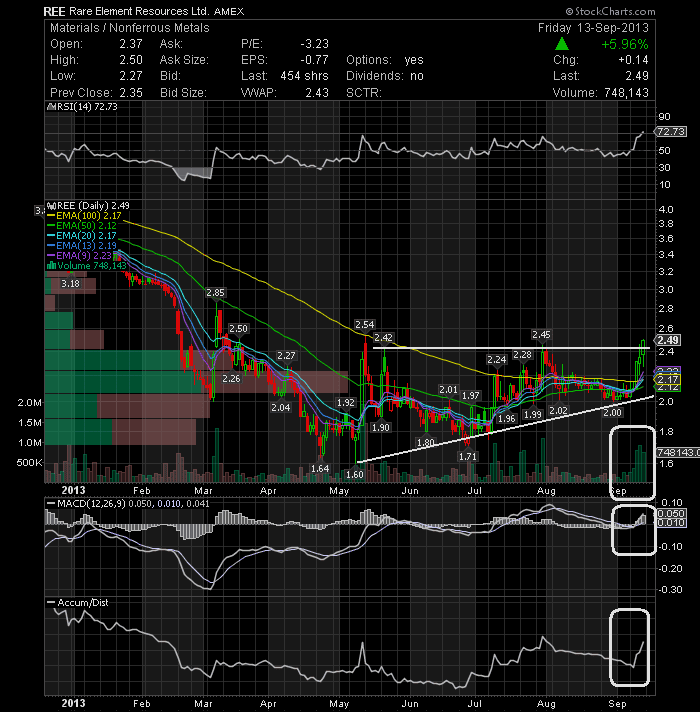 Rare Element Resources Ltd (NYSEMKT:REE) produced a strong bullish breakout with Friday's 5.96% gain. 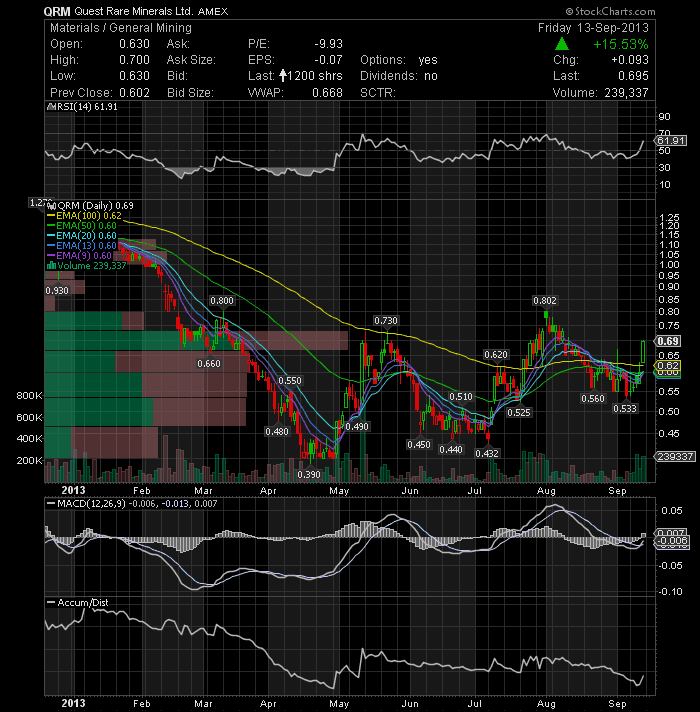 The stock broke out from a large ascending triangle pattern with volume and closed above its recent highs. Looking at the MACD, we can see that we are in bullish territory, so in my opinion, I think this rally may very well continue for the coming week. 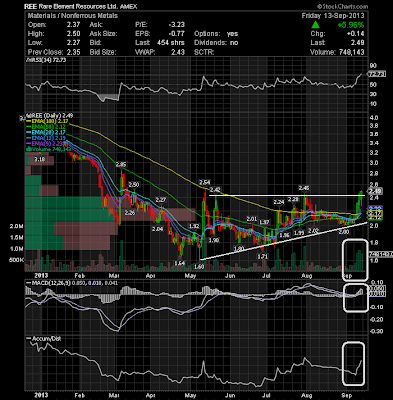 Quest Rare Minerals Ltd Common Shares (NYSEMKT:QRM) opened strong at 63 cents and rallied to a day high of 70 cents. 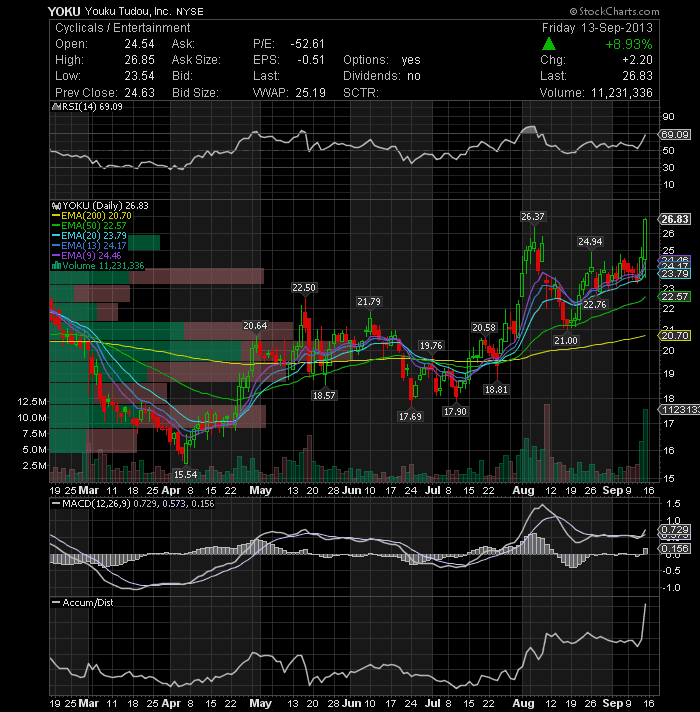 This strong move was sufficient to deliver net realizable intra-day gains of up to 15%. Congratulations to all of you that profited on this stock alert that I put out on Thursday night. Chart still looks good. 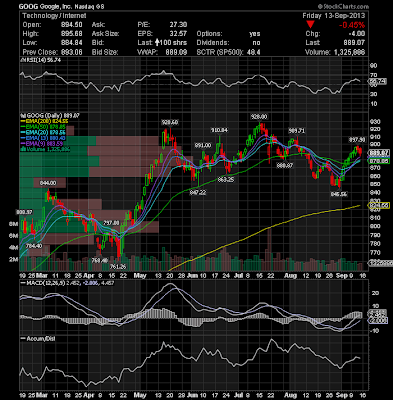 The price of Google Inc (NASDAQ:GOOG) has recovered nicely since the low of 845.56 made on August 29. 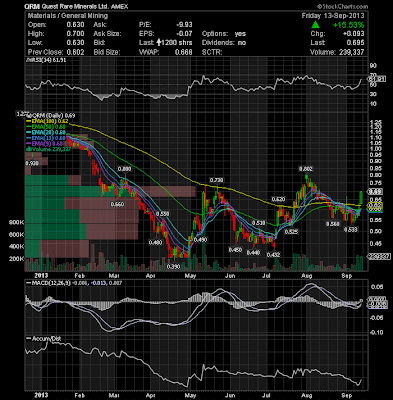 The stock price is currently in a short-term uptrend. There is a possibility of a breakout to 900 or 910 in the mediumt-term. Short-term investors can hold this stock with a stop-loss at 878.52. 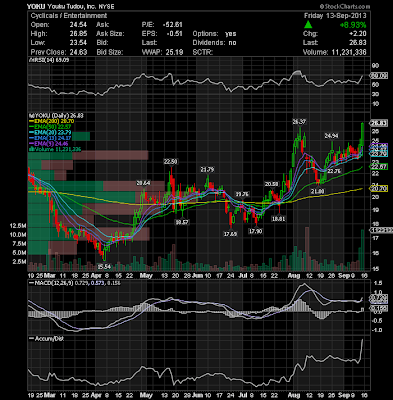 The short-term outlook for Youku Tudou Inc (NYSE:YOKU) looks promising from a technical point of view. 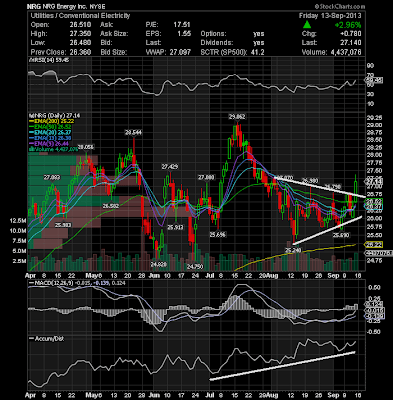 The stock had a nice breakout on Friday with a pop of $2.20 to 26.83 or 8.93% on 11 million shares, the biggest volume in the last 5 weeks. Look for a follow-through next week. Just a last note..... Many thanks for helping AC Investor Blog surpass the 3000 Followers mark on Stocktwits ! I'm going to try to get 5.000 followers on Twitter this weekend....maybe you guys can help me to achieve my goal... It's great to see that the number of followers are increasing day by day, which hopefully means that some people enjoy my daily stock tips. THANK YOU ! !